Take I-70 East to Post Road exit. Go North/Left on Post Road. Turn East/Right on 25th Street and follow to Mitthoeffer Road. 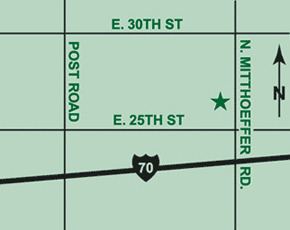 Turn North/Left on Mitthoeffer and follow to 2636 North Mitthoeffer, which is located on the West/Left side of the road. Golden Gardens Adult Day Center is located in the beautiful Atrium Village Senior Rental Community.